An abscess is an accumulation of pus surrounded by fibrous tissue. They may occur anywhere in the body where pyogenic (pus forming) bacteria can establish and multiply. Over time, pus is mostly replaced by fibrous tissue. Abscesses of the lymph nodes in the head and neck region (often referred to as grass seed abscesses), and of the skin (skin abscess), are commonly seen in the export process as a consequence of abrasions or penetrations of the oropharynx or skin from grazing prickly plants, seed penetrations or vaccination needles. Golf ball to tennis ball size abscesses on the cheeks and jaw are probably due to skin penetration from thorns or other sharp objects during feeding or rubbing. Subcutaneous abscesses (skin abscesses) may occur at vaccination sites when vaccination is performed under sub-optimal conditions (wet, dirty or blunt needles). Lumps on the side of the neck are usually vaccination site abscesses. Most cattle are vaccinated on the near side because of the way races and crushes are designed, hence most vaccination site abscesses in cattle are often on the near side of the neck. Skin abscesses also occur more frequently with vaccines containing oily adjuvants. Skin abscesses also may occur where calcium solutions have been injected under the skin when treating milk fever. Haematomas are large blood and serum filled lumps occurring on the bony projections of the hips and rump in cattle following trauma, and may become abscessed over time if contaminated with bacteria. This occurs if pyogenic bacteria infect them via the blood stream or via a contaminated needle inserted to drain them. In the early stages, abscesses may be accompanied by pain, heat and swelling. In later stages, they are cold and surrounded by a fibrous capsule. Rounded, tense swellings under the skin of the ventral neck, the cheek or under the ear are probably abscesses. However, may also be cud stuck between the cheek and teeth, a blocked salivary duct, or oedema under the jaw (bottle jaw). Swellings on the side or top of the neck are almost always abscesses from vaccination. In goats, the abscesses of cheesy gland are common on the ventral neck and under the ear. A burst abscess is recognised by discharging pus. If not burst, an abscess is confirmed by incising the swelling at its most fluctuant or raised point, or inserting a needle and finding pus. Culture of contents may reflect secondary bacteria rather than the primary cause. Antibiotics are ineffective as they don't penetrate the abscess wall. If the abscess is not affecting the health of the animal and is not so unsightly that it might cause rejection at destination or slaughter, then taking no action should be considered. This is because incising and draining the abscess may cause it to become unsightly, or cause complications such as secondary infection and flystrike. In addition, incised abscesses may require ongoing flushing to ensure uncomplicated healing and healing may take some weeks. Medical management may be considered if infection is spreading (or is likely to spread after incision) through the soft tissues around the abscess (i.e. cellulitis) or if the abscess is causing severe pain (i.e. the animal has a stiff neck and having difficulty feeding and watering). In these cases, anti-inflammatory drugs (flunixin meglumine, tolfenamic acid, meloxicam, ketoprofen), and antibiotics (procaine penicillin, erythromycin) should be administered. Note that some abscesses may spontaneously shrink over time which may allow the animal to re-enter the live export process. However, shrinkage may take many weeks or even months. Large abscesses of the lymph nodes of the head and neck (i.e. grass seed abscesses, cheesy gland abscesses) are difficult to treat successfully, may require excision of the node, and many weeks of antibiotic treatment, with no guarantee of complete healing. Affected animals should probably be sent for salvage slaughter. A superficial abscess may be treated by incision and drainage. Before incising, double check that the swelling is fluid-filled, and not an indurated fibrous lump, hernia or haematoma. Restrain the animal (cattle may require a crush, sedation and even anaesthesia if fractious). Clean the area and use a sterile scalpel blade to make an incision at the most fluctuant or raised point of the swelling, or at the ventral most aspect of the abscess. Widen the incision sufficiently so that it won't close over too quickly, otherwise the abscess may reform. Creating a ventral drainage hole may be helpful in large abscesses. Flush thoroughly with clean water under moderate pressure from a hose or syringe using a gloved finger to gently aid removal of pus. Take personal hygiene precautions when dealing with abscesses as bacteria that may be present can infect humans and they may be resistant to antibiotics. Coarse, prickly and grass seed-containing feeds should be avoided if lymph node abscesses of the head and neck are a problem. Source sheep and goats that are properly vaccinated against cheesy gland (caseous lymphadenitis or CLA). Vaccination and other injections should be administered in compliance with manufacturer's recommendations, including for cleaning and disinfecting equipment, the preferred injection site and gauge and length of needles. Vaccinations should generally be administed into clean, dry skin of well restrained animals with a sharp, small gauge needle. This means vaccinating before dipping or spraying, avoiding wet or dirty conditions, and regularly changing needles (every 10 to 30 animals). The needles should preferably be 18g and not greater than 16g, and not exceed 0.5 inch in length for subcutaneous injections. It is important to rotate the needle on the syringe so that the bevel will be parallel to the skin during injection and the injection is administered at approximately a 45o angle as shown in Figure 1.1 below. Changing the angle of injection from perpendicular to 45o and adjusting the bevel as described has apparently reduced the number of vaccination site abscesses in problem enterprises (Fordyce G, personal communication 2011). 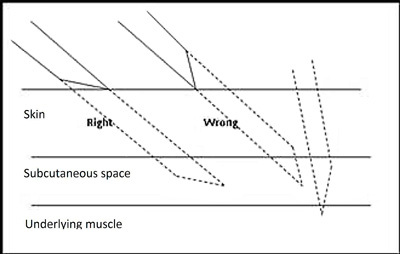 It is recognised that other approaches may be successfully used for injection, including using a needle longer than 0.5 inch and inserting it at right angles to a skin tent fold elevated by the free hand (Manefield G, personal communication 2011).